PHOTO: Allen Ramsey, DWCPhoto.com. 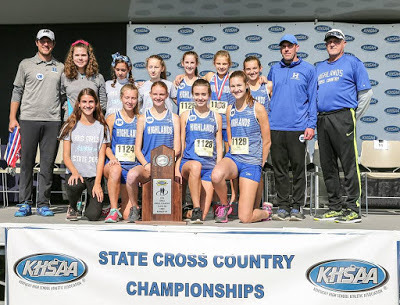 The Highlands Ladybirds cross county team finished state runner-up in the Class 2A meet this past fall. There may not have been a team state champion like recent years. But the 2016-17 season saw a number of Highlands teams still record banner years. The top story again belonged to the Highlands Ladybirds cross country team. Highlands hoped to record five straight state championships despite some graduation losses. But the Christian Academy of Louisville ended the run and Highlands finished state runner-up. But the Ladybirds do return their top seven runners this year led by freshman Maggie Schroeder. The Highlands baseball team also recorded another banner year with its third straight 9th Region championship. Led by another strong senior class, Highlands beat Conner, 5-2 in the region championship after Kyle Finfrock and Sam Hennigan had two-run hits in the third inning. Highlands (26-13 overall) drew Johnson Central again in the first round of the state tournament avenging last year's defeat with a 3-1 win. The Bluebirds had their chances the next day loading the bases with two out in the bottom of the seventh against eventual state champion Louisville Pleasure Ridge Park. But Highlands could not push across the tieing run in a 3-2 defeat. The soccer teams had great seasons capturing 36th District crowns. The Ladybirds finished 20-3-1 making it back to the 9th Region title game for the first time in three years. But after beating the Pandas in the regular season on a Claudia Hils goal, Highlands came up short in a 1-0 defeat to Notre Dame at Tower Park. The Bluebirds hoped to win their first region crown in three years. After beating Beechwood, 4-0 to start the region tournament, Highlands lost 1-0 to Ryle in the region semifinals. The Bluebirds did take out defending state champion Covington Catholic, 2-1 during the regular season. The Highlands volleyball team showed continued improvement going 19-17 recording the first winning season in six years. The Ladybirds won the first two against NewCath but dropped the next three in the 36th District championship before losing 3-0 to Cooper in the 9th Region quaterfinals. In cross country, the Bluebirds finished seventh in the Class 2A state meet. This comes a year after finishing state runner-up. But runners like freshman Will Griffith return next year hoping to lift Highlands to a higher place. The Highlands football team finished a year to forget at 3-8 overall. That marked the first losing season for the Bluebirds since 1955. The biggest win came 52-42 over Cooper to open the season. Highlands took advantage of several Jaguar fumbles to win the game. But Highlands did not win again until posing back-to-back wins over Grant County (50-0) and Boone County (48-28) to finish the season. The Bluebirds then lost 52-32 at Louisville Doss in the first round of the Class 5A playoffs. The golf teams did not see anyone make it to state. The Bluebirds finished sixth in the 8th Region Tournament. The Highlands Ladybirds basketball team (22-9) came into the season with some question marks. But Highlands still managed to win its fourth 36th District crown in five years led by senior Jenna Martin and sophomore Zoie Barth. Highlands recorded a huge win during the regular season on Feb. 6 with a 62-49 win over Covington Holmes. That marked the lone time a Northern Kentucky team beat the Lady Bulldogs in the last two seasons. Holmes ended up losing 51-36 to Franklin County in the state semifinals. Highlands drew Cooper in the 9th Region quarterfinals and lost 77-62. That marked the first time since 2012 that the Ladybirds did not advance past the region quarterfinals. The Bluebirds basketball team finished 12-17 overall earning double-digit victories for the first time since 2013. Highlands beat Newport in the regular season for the first time in a while on its way to the second seed in the tournament. But the Wildcats won the rematch, 73-50. The Highlands swimming teams had more successful seasons. Freshman Finn Murphy took runner-up honors in the 1-Meter Diving event with an overall score of 389.35 points. Overall, the Bluebirds finished 16th in the state meet with 50 points and the Ladybirds took 18th with 35. The Highlands softball team finished 12-18-1 going through its share of growing pains. The Ladybirds edged Newport Central Catholic, 1-0 during the regular season to nab the top seed in the district tournament. But the Thoroughbreds won the rematch, 12-5. Highlands then lost to Dixie Heights, 5-1 in the 9th Region quarterfinals. In track and field, the Ladybirds finished fifth in the Class 2A meet with 46 points and the Bluebirds took 11th with 17 points. Highlands won the girls mile relay in 4 minutes, 8.94 seconds. The runners were senior Beth Ann Griffith, junior Savannah Brady, junior Sophie Steppe and freshman Adriana Muntaner. The Highlands tennis teams saw two singles players and two doubles teams make it out of the 10th Region Tournament. Peter Laskey and Jeffrey Schenk won the 10th Region doubles crown for the second straight year.